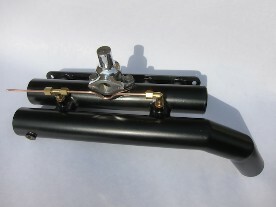 Robin Jackson in the 1930’s recognised the limitations of the MG crested aluminum inlet manifolds. Having a single plenum, the gas charging in at one end to find it’s way to the ports, the oiling up of certain spark plugs and uneven gas pressure to each cylinder, being all too common problems. These manifolds were never therefore, particularly efficient at certain ranges of pressure. The Jackson manifold was developed to overcome all these issues. For the J Type manifold on our own J4 rep, we have chosen to have the gas entering the plenum from the underside and at a central position so gas distribution is balanced to all cylinders. To us, when we built our car many years ago, this seemed to be a logical common sense approach and we know from our experience that it works very well indeed. 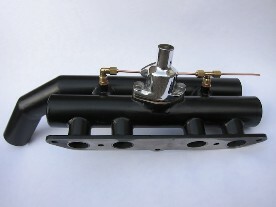 We are therefore providing the enthusiast with an option on both J and P Type manifolds. These are the more typical design (Option A) where the gas enters the manifold from a front via a staggered bend, or our preferred central inlet position (Option B). With the latter option, the path for gas travelling from the blower to the manifold only has two as opposed to four bends when navigating the induction feed (from the blower to the plenum), another reason to chose your manifold carefully. For enthusiasts considering option A, we also offer an Option A1 which is a smooth curve as opposed to staggered bend. We are using a slightly thicker than standard repro manifold pipe wall thickness and our manifolds are expertly jigged up and rather neatly assembled with bronze weld. These are not the more typical TIG welded MMM type. We have also positioned our Ki-gass nozzle entry points in a more sensible position to those we have studied, where the dual Ki-gass injectors often sit either side of the blow-off valve which makes for a messy connection between the two. We therefore mount the Ki-gass jets on the two link pipes between the plenum and emulsion tube which we feel also provides a preferable position for better starting and even the atomizing of fuel into each port. Furthermore, we have designed our jets and manifolds so the jet head sits flush with the top of the internal tubing within the manifold as opposed to a more common recessed position. We have relocated the blow-off valve onto the emulsion tube (nearest the engine) as aesthetically, this looks far neater and the boost gauge union is on the side where it should be and not the top. The manifolds are either in stock or made to order and supplied in a satin powder coated or vapour blasted bare steel finish. When ordering, please remember to state J or P, 'Option A', 'Option A1' or 'Option B'. We also supply blow-off valves, Ki-gass atomiser jets and Wellseal jointing compound.